OS X 10.7 Lion will be soon available for purchase on the Mac app store. All those who have a credit card or Paypal account (USA) can buy and download the update using their Apple user credentials. Using Paypal is not supported in India also most of the Indians are without credit cards. I was using Virtual Credit Cards (VCC) to buy iPhone and iPod apps from iTunes before getting my HDFC Bank Platinum credit card. VCC is just like the usual credit card, but it can only be used once and against a fixed amount. An Apple iTunes account allows up-to five VCCs per month and is accessible within the Mac store. Creating a VCC in India is very easy if you have an HDFC bank savings account and a debit card that they issue. 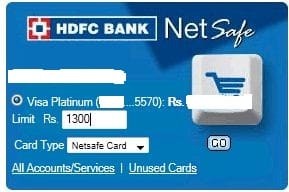 What you need is to Sign up for the NetSafe service from HDFC Bank home page. They will provide an online interface (given below) to create and mange VCCs. The Mac OS Lion costs $29, which is 1300 when converted into Indian rupees. Generate a VCC of that sum and fill those details inside the iTunes payment information page (Store> View My account). Then open up Mac app store, buy and download the OS X Lion. Those who don’t have a HDFC account can also create VCCs using the Entropay online service. Here you need to sign up for their website with a valid Visa or Master Debit card issued by any bank. Hi I want to know the procedure of making a VCC from entropay using PNB atm+ debit card (how to fill all the fields for funding source) and then use it in the itunes for purchasing apps and how to enter the vcc details in payment methods (with screenshots if possible) Please.. and Thankyou.